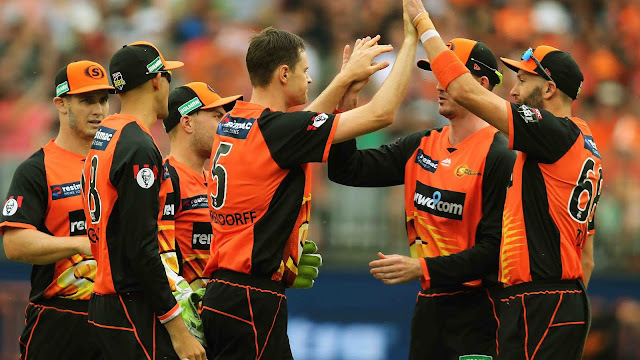 The Perth Scorchers have cruised to their first win of the Big Bash summer against Adelaide after a 0-2 start. 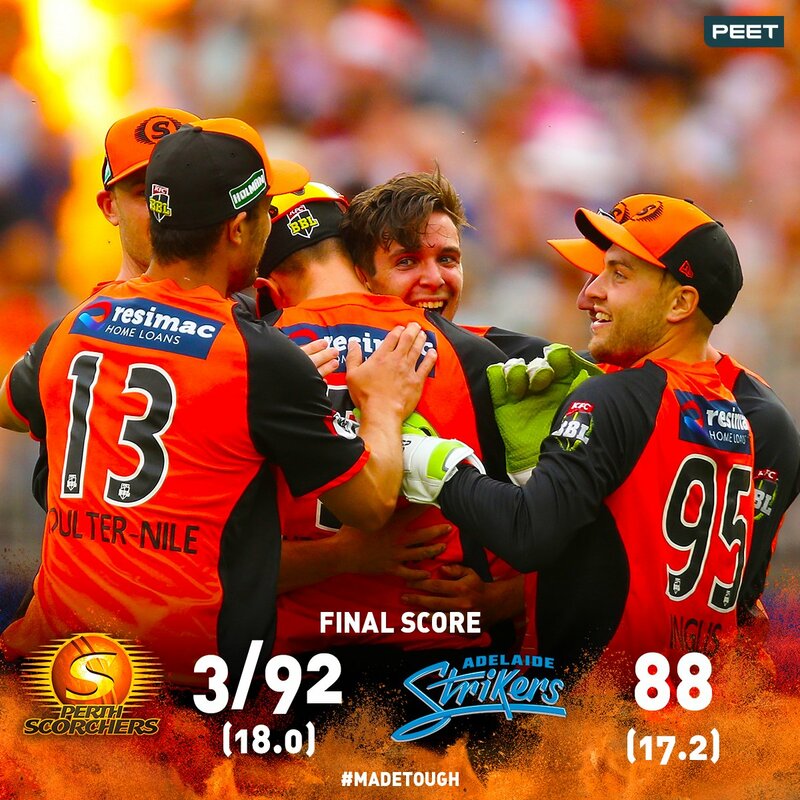 Led by speedsters Jason Behrendorff and Jhye Richardson, who took five wickets between them, the Scorchers prevailed by eight wickets after rolling the defending Big Bash champions for just 88 at Optus Stadium. After some early hitting from returning gloveman Josh Inglis (22 from 21 balls), who replaced the ill Sam Whiteman in the team, captain Ashton Turner (24 from 46) and Will Bosisto (36 not out from 34) scored the bulk of the runs. 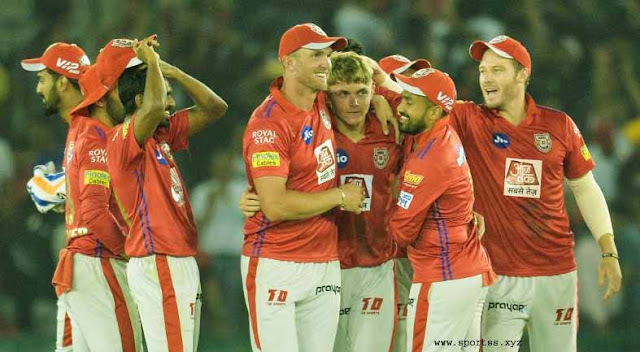 Turner and Bosisto combined for a half-century partnership before the former threw his wicket away with a wild swing with two runs needed to win. Bosisto did the rest, hitting his third boundary to finish the job with 12 balls to spare. Turner won the bat flip and sent the Strikers in, a move that paid dividends. The Strikers lost a remarkable 6-15 during the middle overs before lower-order hitters Cam Valente (21 from 18) and Rashid Khan (21 from 21) attempted to put some respectability into the visitors’ total with some lusty hits. Dashing left-hander Jake Weatherald (22 from 17 balls) was the only Strikers batsman to have an impact at the top of the order, before Behrendorff (2-16 from four overs) had his measure. Weatherald’s opening partner Alex Carey had a forgettable innings, scoring the slowest ever double-figure score (11 from 26) in BBL history. Carey was run out on the third attempt after a horrific mix-up. It was the first of three wickets with the score on 40, with Jake Lehmann out for a golden duck and Jonathan Wells (two) gone next over. Both Valente and Khan fell to brilliant Nathan Coulter-Nile catches in consecutive overs. Ben Laughlin (two) was the last wicket to fall, two balls into the 18th over. Michael Klinger, Josh Inglis, Will Bosisto, Ashton Turner, Hilton Cartwright, Ashton Agar, David Willey, Nathan Coulter-Nile, Jhye Richardson, Andrew Tye, Jason Behrendorff. Alex Carey, Jake Weatherald, Colin Ingram, Matt Short, Jon Wells, Jake Lehmann, Michael Neser, Cam Valente, Adil Rashid, Billy Stanlake, Ben Laughlin.